Devin Smith, commonly known as ‘awesome thanks‘ on social media, specializes in crafting miniature models, from landscapes to creative locations he thinks up on his own. 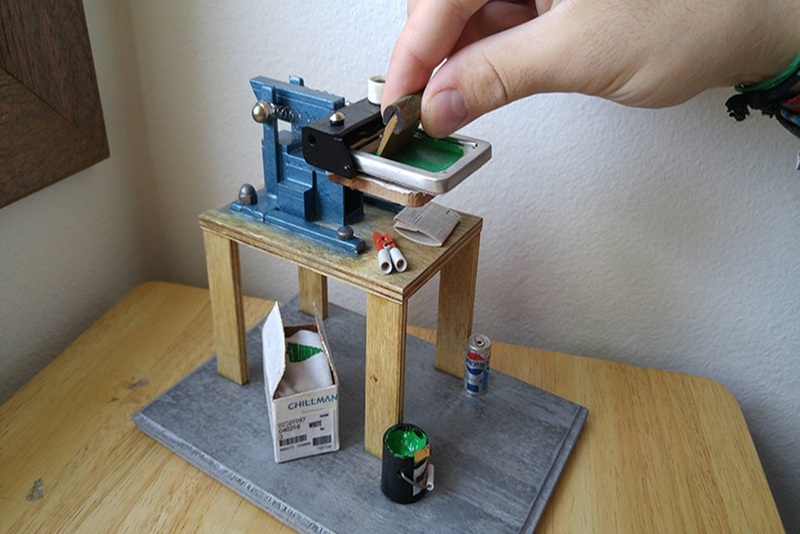 Recently, Smith created a miniature screen printing machine he made from scratch. Smith was inspired to craft this model from when he worked at a t-shirt factory in 2013. The machines were designed to work, similar to their full-scale models. This allows someone the chance to make their own small logos and print them onto tiny t-shirts of their own. This makes it a perfect item for someone to make customized clothing for their collection of toys or figurines. He demonstrates how the silk-screen press works in a brief video. Smith sells his handmade miniature silk-screen press on his Etsy page for $275.